Many people may or may not know (depending on if you read this blog on a regular basis) that I no longer drink alcohol. I last had a drink in 2011 with my trivia group. I think it may have been half a glass of Guinness that I could not get through that my buddy Matt had to finish. That’s about how that ended for me, pretty uneventful I guess, but necessary nonetheless. I guess that was a realization that I had learned long before that evening,but refused to believe because I thought I could maybe change that. I finally realized I couldn’t. I am not one of those people who could manage their condition and be able to enjoy an adult beverage. As one who has had epilepsy half of his life now, it is hard to enjoy things many people can. Playing a game of laser tag, playing video games, going to a hot dance club with strobe lights going off all night long, viewing fireworks on alongside their street on Independence Day,and even enjoying a nice alcoholic beverage after work or whatever. All of those things I mentioned are things I pretty much no longer do, the last one being the biggest. Why you ask? Because at times in my mind, someone who isn’t drinking somewhere where everyone else is drinking generally gets perceived as boring. 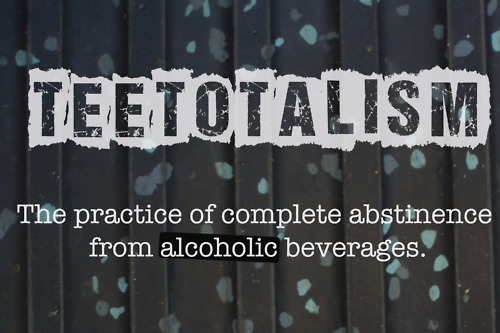 It is something I felt at times when with others who have a drink in their hand and I don’t, but I can’t help it, teetotalism and I chose each other. How did it choose me? Well,epilepsy played a part in it. The medicine I take to prevent a seizure from happening lowers my tolerancy for alcohol. When I would have a drink,I felt like a little kid getting into his parent’s liquor cabinet when he wasn’t supposed to. I felt like the biggest lightweight ever. I couldn’t handle a simple drink. That is how bad it was for me. How did I choose it? Well some time after that last drink I had in 2011 at that bar in Folsom I just said to myself “Look,you’ve tried. You’re not a drinker. Even if you weren’t epileptic, this just isn’t you. Certain types of people can’t drink,and you’re one of them”. It is what I tell people now whenever the subject or question comes up. It seems to end the conversation after that. Now I want to make one thing clear, I am not an advocate for temperance. A lot of my friends drink and that’s okay with me and many of them understand and accept my choice/reason for not doing so. However a person lives their life whether they drink or don’t is up to them and their choice, not mine. So long as you of legal drinking age wherever you live,go for it. Some people may scoff at my decision to be a teetotalist. Some people may try and bring me around to try it again or what have you (By the way,if this is you, stop trying to change people who don’t want to be changed in order to appease you!). Some people may respect that and some will never understand it, but it doesn’t matter. All I know is that the decision to be a teetotalist was the best one for me and my health going forward. It’s a pretty big blessing that we chose each other.